Start and end in Yerevan – the capital of Armenia. 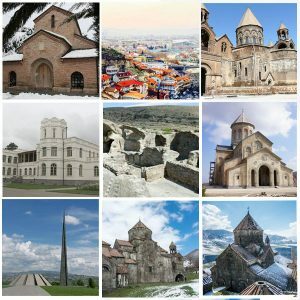 Explore 10 provinces and the Republic of Artsakh with this 11 day / 10 night Gastronomic tour package while enjoying mouth-watering authentic Armenian cuisine. Try Kjufta, Spas, Kebab, Harrisa, “Jenglalov hats” (flatbread with greens), Ghapama and many more. Visit Noy Yerevan brandy factory for a guided tour of the 125-year old factory and an opportunity to sample the famous Armenian brandy. Travel for cheese and wine tasting at the Areni Wine factory and enjoy sun-kissed fruits or special seasonal sweets. For an additional price, visit Ararat Brandy factory to sample the world-renowned Armenian brandy. 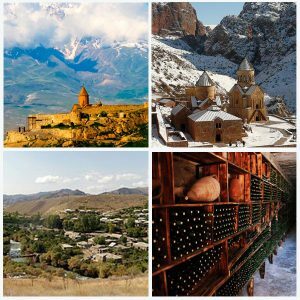 Visit UNESCO World heritage and archeological sites, medieval monasteries, breathtaking mountains and picturesque countryside of Armenia. Arrival at the Zvartnots International Airport. Transfer to hotel. Welcome dinner at a traditional Armenian restaurant. Enjoy a guided city tour around Yerevan. 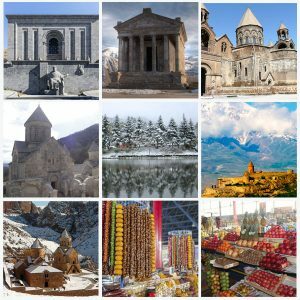 Visit Matenadaran – the depository of ancient manuscripts, The Cafesjian Center for the arts, The Cascade complex with massive staircase and fountains, The History Musemum of Armenia and The Tsitsernakaberd – the Armenian Genocide Memorial Complex. In the evening, enjoy the dancing fountains at the Republic square or check new venues from countless bars, nightclubs and restaurants. Travel to Sardarapat memorial complex and visit the Ethnography and Liberation Movement History Museum adjacent to the memorial monument. 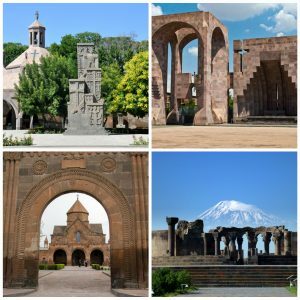 Return to the city of Echmiadzin and visit the The UNESCO World heritage sites of Echmiadzin Cathedral – the Mother church of the Armenian Apostolic church. Visit 7th century St. Gayane and St. Hripsime churches and the church of Shoghakat (1694). Have lunch at Machanents Cultural Tourism and Art Center in Echmiadzin and continue to archeological site of Zvartnots, another UNESCO heritage site and one of the exquisite landmarks of medieval Armenian architecture. Travel to the village Garni to visit the pagan Temple of Garni – “the Temple of Sun” constructed in the first century AD. View the ravine of Azad River and the Geghama mountains from the edge of the temple. Have lunch in this beautiful corner of nature and enjoy the culinary delights of Armenia, then watch the process of making the Armenian flatbread-“lavash”. Continue to Geghardavank Monastery Complex (“the cave monastery”) founded in the 4th century by Gregory the Illuminator. Return to Yerevan in the afternoon. Travel to Khor Virap (meaning “deep dungeon”) monastery and pilgrimage site to learn about Gregory the Iluminator then on to the 13th century Noravank monastery with its ornate architecture. Continue to Areni Wine factory to enjoy wine tasting followed by lunch at the newly established restaurant located on the premises of the factory. Then on to “Wings of Tatev” – the longest aerial tramway to fly over the Halidzor gorge to Tatev Monastery. Continue to Goris in Syunik province for an overnight stay. Travel to village Khndzoresk in south-east of Syunik province. Walk on a 160-meter swinging bridge hanging over a canyon that connects the two banks of the village. Enjoy the picturesque view of the caves and rock formations. Continue to the Republic of Artsakh and visit the fortress city of Shushi situated on an altitude of 1,400-1,900 m. Explore local landmarks and traditional houses. 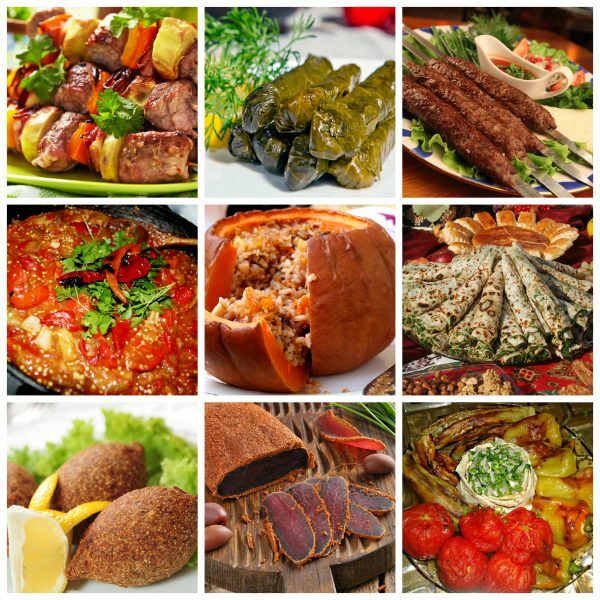 Then visit a local eatery for a hearty lunch. Continue to Stepanakert – the capital of the Republic of Artsakh. Overnight in Stepanakert. Travel to Gandzasar monastery (“the treasure mountain”) built between 10th-13th century, then on to Dadivank monastery built between 9th and 13th century. Continue to the largest freshwater alpine lake in Eurasia – Lake Sevan, set 1,900m above the sea level. Try the most coveted delicate dish-khorovats trout, bred in the Lake Sevan. Overnight in Yerevan. Spend the day in Yerevan to pick some gifts and sweets for yourself and your loved ones. The GUM market has an endless variety of dried fruits with or without sugar as well as “Alani” (dried peaches stuffed with ground walnuts and spices) and sweet “sudjukh” (a string of syrup-coated large walnuts). Then walk to Vernissage – the open-air craft market to find modern and Soviet era souvenirs and various crafts. Continue to the famous Gold market in Yerevan, to find gold and silver gifts of your choice for any occasion. Travel north to Lori – one of the most picturesque provinces in Armenia. Visit UNESCO heritage sites – the medieval monasteries of Haghpat and Sanahin. Then continue to Dendropark covering an area of 35ha and fell in love with its natural forest and ornamental trees. Travel to Gyumri for overnight stay. Gyumri City tour. Gyumri is the capital of Shirak province and the second largest city of Armenia.The city was founded as Kumayri in the 8th century BC, later rebuilt and renamed to Alexandrapol by Nickolas I of Russia. Gyumri was devastated during the Spitak earthquake in 1988 and many buildings have not been recovered yet. Explore the unique architecture and historical landmarks of Gyumri. 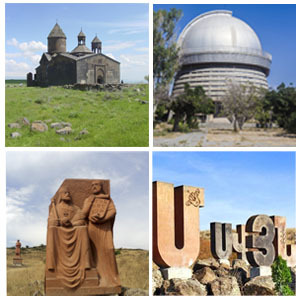 Travel to Aragatsotn province to see the famious monument to the Armenian alphabet.